Polymer Vision, the world's first company to bring out a device with a rollable display in the Readius, is set to unleash the device on UK shores by this October. The Readius will use a 3.5G HSDPA data connection to bring RSS feeds, newspaper aggregation and e-book and email capabilities to the five inch foldable display. The device is set for a pan-European launch this autumn, thought the only announced supplier of the Readius is Telecom Italia in…well, you can work it out. In the UK, Polymer Vision has spoken to a number of suppliers about a launch strategy, including Vodafone, O2 and T-Mobile among others, but has not settled on how the Readius will debut. "We're targeting the UK market as one of our early launch countries," said Thomas van der Zijden, VP marketing & sales at Polymer Vision. "We're talking to all the mobile network operators, though we have a variety of channels to market. "For instance, an operator could buy the Readius from us and sell to the market. Alternatively, we could sell the device ourselves with a white label SIM card, or the user could buy the Readius and use their own data card." 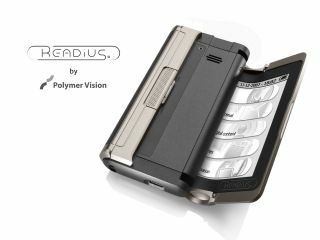 Polymer Vision is making content available for the Readius when it launches on Readius.com, where you can also sign up for updates on the device. If you like getting updates on that sort of thing.